"Flying Paragliding Competitions - A Primer"
Much of the anxiety you may feel, when attending your first few events, is caused by the fact that, “you just don’t know, how much you don’t know.” This chapter gives you a look at what to expect during a competition and what’s expected of you. Because many new XC pilots participate in weekend league meets, this type of event will be discussed first. League events differ from larger competitions in that the number of participants is smaller and, even though they are more informal, your workload will be a bit higher to ensure that you are properly prepared for the event, logistically. The league will have a website that is used to disseminate information, distribute waypoint files, and list pilot rosters. You would do well to explore all areas of the website before attending your first weekend comp. An example of excellent use of this medium is the Northern California XC League site. 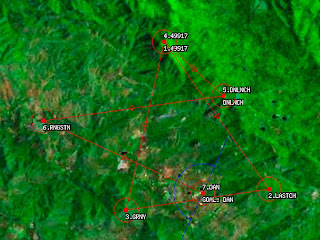 You are provided with waypoint files and topographical maps, as well as Google Earth .KML files with points of information (lift sources, LZs, cautions, etc.) Take the time to do your online registration and waiver, if this is an option. Get as much done before the event as possible so you can concentrate on the task. A lot of work goes into a site like that listed above – don’t be the guy who shows up at the last minute without the waypoints loaded, without maps, and without a clue. Do your homework so you can get to the flying without being a distraction for other pilots. Show up at the designated meeting place ON TIME. When 25-30 pilots get together and wait for stragglers it has a tendency to blow the day, so we don’t wait. If you are left behind, it creates logistic problems with your vehicle being stuck at launch, etc. Be on time. OK, you have arrived at launch and you begin getting the lay of the land. Find out when the site intro will be conducted. Sort your gear and have it ready to go. Eat something (you did bring a sandwich didn’t you?) and drink water. Lurk, introduce yourself, learn who’s been here and get as much local beta as you can. You are basically killing time until the pilot meeting. Use this time wisely, and your day will be more relaxed and successful. At league meets the Pilot Meeting is very important. All information, considered important enough to pass along to all pilots, will be discussed. Don’t get yourself stuck next to a guy who wants to chat. Bring a pen, paper, and your flight instruments and map to the briefing. Information regarding rules, no-land fields, and safety will be discussed. Information such as phone numbers and email addresses will be provided, which may become very important. A ‘buddy system’ may be used to organize groups who keep an eye on each other at the end of the day. Pilots with similar experience and performance, in groups of 3-5, will make sure all members of their buddy-group are down safe and accounted for with each other, and the meet director. 3. Verify (and input, if a GPS feature) all cylinder diameters. 4. Set up the start (If a GPS feature) and verify start diameter, EXIT or ENTRY START, and start time. 5. Activate route (if required). 6. Verify countdown timer (if GPS feature) is correct. Let’s talk a bit more about ‘good form.’ It’s often hot at the launch, and standing in the launch queue in full regalia isn’t comfortable. It is, however, very bad form to get in the queue when not fully ready to launch. You should have all harness buckles checked & double checked, gloves and helmet on and be ready to go. I recommend launching early, but this is simply technique. I figure that if indications are that it is possible to stay up, and conditions are favorable, it makes sense to get in the air before it blows out or the queue gets long. Launching 30 to 45 minutes before the start allows you to launch before the majority of participants crowd the launch queue. It also allows you to explore a bit and get a feel for the top-of-climb, wind, and develop a map of the start cylinder, so you can formulate a tactical plan for the start. When new to comps, the launch can be a bit intimidating. Launch only when you are ready and the cycles are right. If you are lined up 2 or 3 abreast, announce your launch when about to pull-up. DON’T get in a hurry and rush the launch. If you don’t like the conditions at launch, there is no shame in stepping out of the queue. Remember Rule #1 - Don’t make decisions that you wouldn’t make while free flying. Your safety is your responsibility. I usually listen to talking books while driving down the road. Friday I was headed to Dunlap for the first XC weekend of the 2010 season when my Dean Koonts novel had just come to a rather creepy termination. I fired up the Sirius receiver & tuned in some Classic Rock. Soon Bob Segar was singing a medley from a live performance in 1972. I have to admit, that guy had some serious talent. Something about the tune really haunted me & I found myself humming the tune all weekend long. So anyway, I arrived in the Dunlap valley at 2pm and was hoping for a ride to launch for a quick flight before making camp. I headed for Dan's to see if I could swing a ride up the hill. I talked briefly with Greg, found that I was the only pilot going up, and soon was riding with a gal named Day to launch. When I got to launch I ran into Tim & Scott. I gave them a bit of local beta and set up to fly. The lift was a bit 'edgy' but went to cloudbase at 6000'. I boated around on the Boom 5, enjoying the opportunity to fly high enough to experiment. This was also my first flight of any duration on the new harness (a WV X-Rated 5) so I was able to make some adjustments and figure out how to make this harness a part of my "XC System." Tim & Scott soon launched and we all ended up at Dan's and, later, shared some beers and burgers at a local Dunlap dive. Thanks for the beer guys! Saturday I woke, after a great night's sleep in my pop-up, and headed down to the valley floor to meet the crew. There were quite a few pilots from all over - Reno, SoCal, Sac, SF, Santa Cruz, Tahoe, etc. We had at least 25 - a great turnout! I had 4 mentees in attendance; Dudi, Stephan, Brad, and Aaron. We all headed up the hill knowing that the day looked a bit weak and inverted. We did quite a bit of site intro for the new pilots and worked with our mentees a bit. I figured we would need to do most of our work after the task was called. We built a rather short (34km) task, that had more than one crux. as it crossed the valley four times. Given the low climbs of 4500-5000', there were many opportunities to dirt early in the task. I launched early & had a decent start. The gaggle wasn't very high so the first beat up to 49917 was sketchy and many of us were low on the face of the mountain, ridge soaring around the corner to try to tag the cylinder. I was 50 meters too low to tag the turnpoint on my first pass, so I went back for another figure'8' in a bubble and tagged it next pass. It was low and desperate most of the way down to last chance. Fortunately I had caught a few of the lead gaggle and we worked together to find a bubble and climb enough to tag Last Chance & get back to the main ridge. Those that stayed on LC to work the weak lift soon worked their way down to a landing at Dan's. . . I caught a nice 4-500'/min. thermal in front of launch and soon rejoined my high aspect ratio buds. We all headed across to Granny's Knob together and found a sweet thermal that gave us (almost) enough altitude to get across to the main ridge again. Josh and I headed out together and I aimed for a rock face that I hoped would provide some heat. Josh got there with about 400' more than I and had an easier go of it, but I was able to get up, in time. My thermalling still isn't as accurate or comfortable as it was on the Avax XC2 - maybe due to the much heavier brake pressure, maybe due to lack of familiarity. At this point Josh took off and hit 49917, DNLCH and went on glide for goal. I hit 49917 & DNLCH but couldn't get high enough to head out on final glide, so I headed back up to 49917 for some additional altitude. This cost quite a bit of time, but by now I realized that the task was over for all but Josh & me. Unfortunately I couldn't get high enough to get a 'glide-to-goal' of less than 14:1. I searched in vain & watched as the CirroStratus slowly shut the day off. Finally I decided to head for RNGSTN with the intention of scoring a bit of lift at the knob between Turkey and the ranger station. The prevailing wind would provide drift towards goal as I surfed the cow farts, so there was some hope. . . I hit the RNGSTN turnpoint with exactly 1000 meters of altitude (about 400meters AGL) and a glide req'd to goal of 20:1. No bumps were felt all the way to the ground. I landed in the Turkey farm relics, a little over a mile from goal..
Josh made goal and Susan did a great job, making it to the ranger station. It was definitely a day that required an awareness of pacing to match the conditions. I think many of the new pilots were a little frustrated with the day. The task made them attempt crossings they wouldn't have if they were free-flying. This is one of the primary differences between flying the path of least resistance and flying a prescribed task. Much of the initial (steep) learning curve is spent learning this pacing aspect of flying a task, and planning tactics to get around the course. Watching more adept pilots is very helpful in both of these skills. Because the first task was found by most to be a tough one, and because Sunday's forecast was very similar, we decided a "Do-Over" task would be valuable. The same task was called with a bigger radius at RNGSTN. In reality, the day turned out to be very weak, and we weren't getting the climbs we got the day before. I tried a hail-mary from Granny's Knob back to the main ridge and found only teaser-lift. 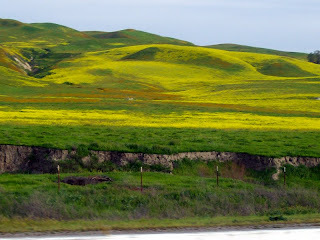 I dragged much of the lead gaggle with me & we all ended our day at the St. Nicolas Ranch LZ. Results are HERE, and my flights are HERE. I feel the weekend was a great shake-out for all the guys with new equipment & wings, and a great intro to the comp format for the new guys and gals. Next time it will be less intimidating and they will have a feel for the pacing of the day and the flight. As I drove home, and recapped the weekend, filled with people, laughs, flying and fun - I realized that I was still humming that Pete Segar tune - It was the Travelin' Man/Beautiful Loser medly . . .
You want to give it a try – but are you ready? You don’t have to be a sky-god to fly your first few comps – Just not a danger to yourself or others. You can build your list of skills gradually. Let’s go down the list and discuss how to develop some of the tools you should have in your aviation toolbox. • Pilot Readiness. It is imperative that you are properly mentally prepared to fly in Paragliding Competitions. A beginner with Intermediate Syndrome and a gung-ho attitude is a little scary to watch – and dangerous to be. You need to talk with pilots who have flown comps and understand the game. You need experience at flying away from the local hill and the understanding that an XC flight should be conducted with the same level of safety and sense as that of a simple local flight. You need to fly every flight with a commitment that you will not go places, or fly in conditions, that you wouldn’t while on a non-comp-local flight. Risk / Reward management is the primary skill that one needs to cultivate while building an aviation toolbox.  Assessing Weather conditions. The ability to assess the changing weather conditions while flying is essential. When you fly locally, don’t just be a follower. Try to understand how the local wx guru determines the forecasts and decides on likely flying spots. Look, also, at the weather on non-flyable days to develop a talent for seeing the hazards hidden in the forecast. Get to the site early and watch the conditions change. Note the visible hints and timeline of change vs. your forecast. All these skills will make you a safer and more tactical pilot.  Consistent Launches in variable conditions. Practice, Practice, PRACTICE. Mountain pilots don’t get to kite as much as coastal pilots, so the skills are different. Both groups should work hard to develop their weak skills. Know how to time your launch in a thermal cycle. Know how to control the wing in a stronger-than-anticipated gust. Ask – Practice. o Turning in weak thermals. When you are new, the temptation is to take ANY lift available. That’s fine until you see a bird, trashbag, or other glider climbing faster than you are. If you see this you should move to that thermal. Learn to judge climb rates of others while you are in a thermal. o Not turning tight enough. Keep your turn going. Let the gaggle guide the circle for a bit and just climb with the collective. When you are in a gaggle, it’s not your time to try to modify the circle. If you have pilots consistently cutting the turn, behind you, it means you need to tighten the turn. o Not keeping a constant attitude while banking up. When you tighten your turn, keep a constant nose attitude so you don’t spiral down through the gaggle. o Be Polite. Remember that this is one of many climbs today. You don’t need to ‘win’ this climb. Fly cooperatively and respectfully. Don’t try to stay out of the way, that almost always creates problems since now, you are not doing what they expect you to do. Try to be predictable and signal your intentions with body language. o Enter like a PRO. You can make a name for yourself (not a good one) very quickly by entering a gaggle the wrong way. When approaching a gaggle you must look at it like a turnabout that you are merging with. Choose a gap in the parade and fly outside the turn, on a tangent, and slowly slip into the gaggle. There is no need to crowd or barge. o Leave when the lift fades. There is little to be gained by staying with a thermal once the lift begins to fade. You will be in a better position staying with the gaggle. Assuming your altitude is close to that of the gaggle’s, when the gaggle rolls out on glide you should too.  Navigating. Practice with your GPS. I’ve set up waypoints at my local hills and built tasks to go through all the steps in flying a task. It is important to feel confident in your instrumentation and your ability to use it.  Wing Control. Flying the wing simply has to be a secondary task. You must build the experience to keep the wing over your head even when flying in dynamic air. Don’t get in the habit of looking up at your wing every time you fly into turbulence. Sense your wing position as a bird does – through your body, hands, and sight. o A size that is appropriate for the conditions and slope. o Wind direction and speed. o IMPORTANT – Look for a backup spot in case of; wind change, low altitude pop, etc. Nice to have a place to go when Plan ‘A’ doesn’t work. It’s nice to work in a nice thermal trigger along the way to your LZ, so you are giving yourself an opportunity for a save while maneuvering to land. Strict discipline is important though. You should abandon all efforts for a save at an altitude (I won’t pick a number since it is conditional) and stick to that decision. Most pilots who get hurt, while landing out, start their stories off with something like, ‘’I was on base leg when I felt this great bit of lift off to my right. . .’’ While flying your approach to landing you must consider that you are tired, dehydrated, disappointed, and concentrate on the task at hand. Get down safe so you can fly tomorrow’s task. While on the subject of landing out: Nobody looks good while throwing a tantrum or sulking. If you have a bad day, either go away to sulk alone or hang out with your buddies and regale in their success. Know that everybody has had a bad day. Fly enough events and you are surely to have a bad competition, where every task is a struggle and your results are dismal. Don’t get wrapped up in the results. You are doing this for fun and the pilots who have longevity in the sport never forget this – they are truly a treat to be around. 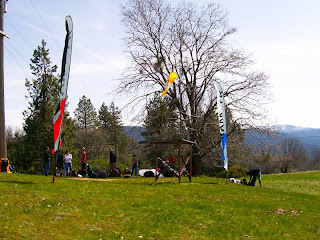 The following post is the first installment of an article I'm writing for new pilots entering, or considering entering the Northern California Cross Country League. Subsequent posts will cover additional aspects of the subject. If you have any recommendations along these lines or subjects you would like to see covered, please comment or send me an email. When I first learned to fly paragliders, I had been flying for 35 years. I’d flown various flying machines that ranged from 400 lb. sailplanes to 875,000 lb. commercial airliners. I was no sky-god, but I was a “Flyer.” I was the guy who looked out the window of a car and wondered what flying along that ridge would be like; and I’m the guy that my wife had heard, innumerable times, say, “I wish I was a bird. . .” Paragliding was the perfect combination of freedom, autonomy, and challenge. That said, when I learned to paraglide in 2003, I viewed the sport of racing paragliders like I viewed moped racing – “What’s the point?” Then, in 2004, I began to yearn for more adventure, more challenge and started straying from my home site to fly cross-country. This thrill rekindled the excitement I felt when I was 15 and first flew my sailplane over a couple ridges to land in a friend’s pasture. 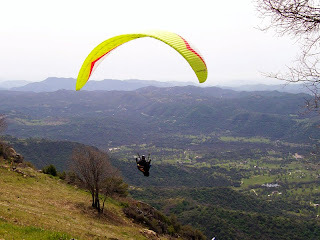 In 2005 I was flying a popular LTF 1/2 paraglider and entered my first XC competition and really enjoyed the challenge. I took it slowly & didn’t score very well, but I learned so much in just 6 flights that I was truly hooked on XC competitions. I’ve learned that I learn best by reading all I can and visualizing events, then applying what I’ve learned. I also found that I gain value by ‘debriefing’ and critiquing – writing down my observations for future reference and comment by other pilots I respect. The main documentation is done on my blog. This paper is an extension of that process. Much of it is personal opinion & observation. Most of that is information I have gleaned from others. It is meant to be a tool for those who are considering entry into XC Comps. By removing some of the unknowns, I hope to make your entry into this sport more comfortable and safe. Nothing has done more to increase my enjoyment of local flying, and improve my skills, than participating in XC competitions. Paragliding is an inherently dangerous sport. Nothing in these pages should be construed as encouragement or endorsement of YOU entering the sport of Cross Country Paragliding. This paper is written to document what I have learned about the sport. I encourage you to use your judgment and training to decide whether your qualifications are appropriate and your life is ready to engage in this activity. 1. Paragliding Competitions - Right for You? What are Paraglider XC Competitions? 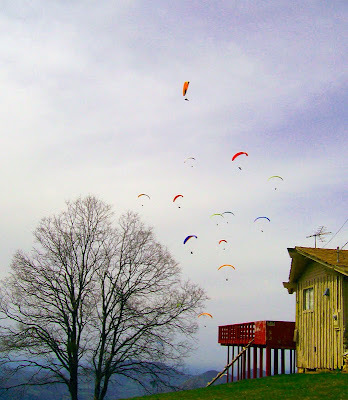 The paraglider community has held paragliding competitions since the sport caught on in the 80’s. Early wings had atrocious performance and even worse flying characteristics, so these comps were true thrill-sporting events. The modern paraglider is much safer and has the performance to fly long distances at high speeds relative to the early days of the sport. Generally speaking, most XC Comps are events that have a defined task, over turnpoints, to a goal with scoring points accrued for distance flown and speed-to-goal. There are other formats that will discussed later, but this is the format that will be considered for most of the examples. Task setting based upon weather knowledge and local knowledge. It’s like having the local guru give you personal advice on where to fly. The tasks often push you to reach goals that you would otherwise think unreachable. During the task briefing, listen carefully to any cautions and predictions; particularly forecasts of valley winds and over-development. Retrievals. You have a group of pilots all heading the same direction and cars along the route to pick up those who land out. Comp organizers look for every last pilot until they are all accounted for. Camaraderie among the participants is very encouraging and educational. Just ‘lurking’ at launch provides many tid-bits of information regarding equipment, tactics, and technique. Logistics. Most competitions will have worked out accommodations, safety procedures, launch recommendations, repair services, emergency services, and retrieves etc. Safety. The prospect of planning and flying cross-country flights can be sketchy without the above items. It is my opinion that a well-run competition is the safest way to fly XC, especially for the newer XC pilot. FUN – These events can be a lot of fun. I’m the first to admit that there are some pilots who shouldn’t fly, or aren’t ready to fly, in XC Comps. To safely fly away from the comfort and familiarity of the ‘nest’ introduces many new variables that one needs to observe and react to correctly. If a pilot is unable to deal with variables (wind changes, obstacles in the LZ, turbulence, etc.) he should gather more experience before leaving the nest. Another factor to consider is nerves, or lack of confidence. Some nervousness is normal (and healthy) but too much can hamper your ability to respond to changing conditions and react correctly. XC is all about decisions. When you are making consistent good decisions and are looking for additional challenge, it is time. As you read the equipment and skill requirements necessary to participate, it may seem a bit intimidating. Remember that this is something akin to collecting and building a foundation that allows you to enjoy the benefits of our sport. A pilot who is capable of landing in an LZ assessed from the air; who has demonstrated thermalling ability in traffic and control of her wing in turbulence; who is willing to make mistakes and endure disappointment to learn the game – is qualified to fly a competition. Generally a P3 with endorsements or a P4 are required to enter a national competition. Local/regional comps are not so concerned & minimum rating is determined by the rating required to fly the launch site. Pilot Readiness - The most important prerequisite is your mental readiness and emotional control. You must be prepared to endure some disappointment while doing your internship as a new XC pilot. Too much competitive drive, coupled with too little experience is a recipe for disaster. Approach your first few comps as student of the game. There are so many aspects one must master to be a good XC pilot that it will not happen overnight. An XC pilot should be fit enough to carry his PG rucksack for at least 3 miles. Acclimatization before flights above 3500 meters is highly recommended. Assessing Weather conditions. The ability to assess the changing weather conditions while flying is essential. Your safety may rely on your reactions to the weather and its changes, even in unfamiliar locations. Consistent Launches in variable conditions. Launch often feels like the first Tee at the US Open for new pilots. The “yips” are very real unless you are comfortable launching. Practice getting your wing up in less than optimum conditions. Thermalling - in traffic. You can’t fly far if you can’t stay up. Practice at your home site. It isn’t as scary (usually) as it looks to be in a gaggle of well behaved pilots, but things can be hectic. We have all left gaggles we thought were not safe, but gaggle flying is a skill you will need to develop. Navigating. You don’t need to be Magellan, but you need to be able to visualize the task and how you want to fly it. The truth is, that your early comps will have you playing follow the leader but you will be building navigation skills as you fly each task. Build judgment skills that allow you to decide whether you can make a thermal source on glide. Wing Control. We fly our competitions in the heat of the day, when conditions are their best and, often, rowdiest. The conditions are not dangerous, just very active. Each pilot needs to keep their wing over their head. SIV experience is very helpful. Confidence in your skills and ability to control the wing is essential. Assessing LZs from the air and planning the approach and landing. The most dangerous part of a XC flight is the approach and landing. You may be tired and dehydrated. It is natural to be frustrated if you land out. You will unconsciously relax, since the task is now ‘forgotten.’ You will need to exercise discipline to maintain focus and a healthy paranoia during the approach and landing. Any modern LTF 1/2 rated (or higher) wing can be flown in XC competitions. A properly adjusted “Speed-system” is imperative. You do not need the latest and greatest – just a wing that you are comfortable on and confident in. Reserve Parachute is required. It is generally accepted that the reserve should be less than 10 years old and regularly inspected / repacked by a pro. Transceiver capable of transmitting on the common frequencies. Many transceivers need to be modified to transmit on USHPA frequencies. It is helpful to have a speaker/mike to allow easy operation of the unit. Don’t invest in fancy PTT (push-to-talk) systems. They tend to be distracting, damaged easily, and are outlawed by many comp. directors. VOX (voice activated) systems are a very bad idea at comps. Keep it simple with either a chest harness or a simple speaker mike. GPS unit. You will need a GPS unit (preferably one with a 3D tracklog) and cable to download waypoints and upload tracks to/from your unit. For your first few events a simple GPS is fine. Later you might opt for an integrated unit which displays more information in a more useable format. These units are great at ‘unloading’ the pilot – allowing him to concentrate on flying rather than computing final glide figures. Serious XC Comp pilots carry a backup GPS as a track logger in case of primary instrument failure. Variometer. You will want to carry either a variometer or an integrated GPS instrument. Some pilots carry an audio only vario as a backup. These are the essentials. More on what pilots carry in their kit, in later sections. More to come in future installments . . .